Successful first flight marks major milestone for Company’s Melbourne, Florida facility . ​Melbourne, Florida, USA, December 8, 2011 – The first Embraer Phenom 100 entry level business jet built at the Company’s new Melbourne, Florida assembly facility made its first flight yesterday at Melbourne International Airport. The aircraft flew to an altitude of 41,000 and to speeds up to its MMO (Maximum Operating Mach number) with zero anomalies. According to production test pilot Joao Rafael Silva, the two and a half hour post production evaluation flight went exactly as planned. The aircraft successfully flew designated items from the standard test card used to evaluate systems and performance of each Phenom 100 aircraft prior to delivery. Embraer opened the Melbourne production facility in February 2011 and just last Monday, December 5th, inaugurated its 58,000 square foot, state-of-the-art Global Customer Center. This first US-made Phenom 100, built for Kansas City-based Phenom 100 and Phenom 300 fractional provider Executive AirShare, is slated to be delivered before the end of the month. 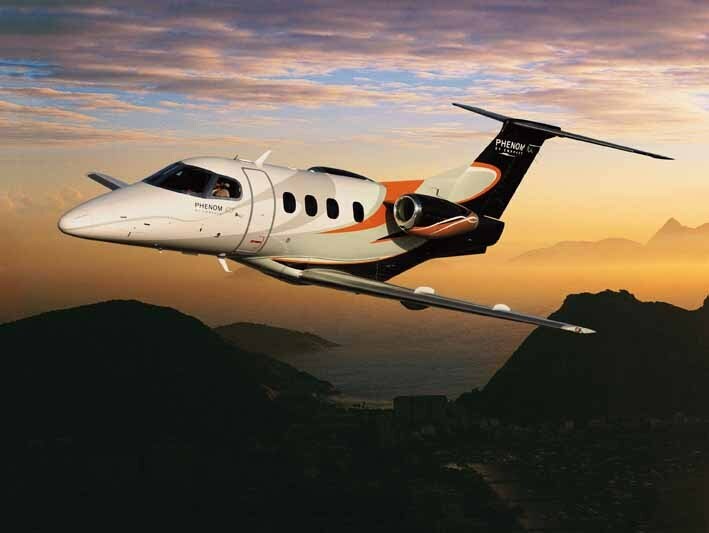 The entry level Phenom 100 can accommodate up to eight occupants and has seven different interior options designed in partnership with BMW Group DesignworksUSA. Its range of 1,178 nautical miles (2,182 km), including NBAA IFR fuel reserves, means the aircraft is capable of flying nonstop from New York to Miami, in the U.S.; from London to Rome, in Europe; or from Brisbane to Melbourne, in Australia. The jet was certified in December 2008, and has proved to be the fastest and to have the largest baggage capacity in its category. The Phenom 100 has the latest in cockpit design, and a private aft lavatory is one of its competitive features.